Author McKay Jenkins On "Food Fight: GMOs And The Future Of The American Diet"
McKay Jenkins teaches journalism at Univ of Delaware. Over the past 20 years, a revolution in biotechnology has allowed scientists -- and the giant ag-biotech companies many of them work for – to blow past the tedium and imprecision of ages-old traditional breeding and dive directly into the DNA -- the genetic core -- of a plant, animal or microorganism, and move desired traits in or out as needed. The result is that nearly all of four major crops being grown today -- corn, soybeans, canola and cotton -- are now genetically modified, high-performance varieties that a majority of farmers in the US and many other countries have been planting with gusto. But the worldwide proliferation of these new GM crops has raised fundamental questions that go far beyond “are GMOs safe to eat?” The questions go to the nutritional value and diversity of the foods we buy and eat every day, to the social and economic structures of food production and marketing, and to the quality of the environment in which our food is being grown. McKay Jenkins may be just the person to make sense of this complicated web of science, industry and culture. The author of seven books, Jenkins has been writing for the past 30 years, in various ways, about our connections with the natural world. Two of his recent titles have explored problems in the modern chemical industry: ContamiNation, published last year, is an investigation into the many toxic synthetic chemicals we encounter, often unwittingly, in our daily lives -- and a guide to avoiding them. In 2014, Jenkins published Poison Spring, co-written with E.G. Vallianatos, which examines the disturbing collusion between the Environmental Protection Agency and the chemical industry it was created to regulate. His latest book is the one we’ll be discussing today. 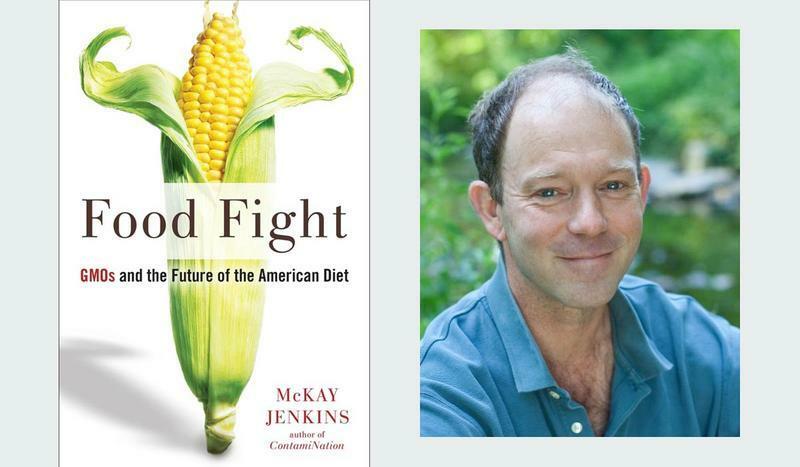 It’s called Food Fight: GMOs and the Future of the American Diet, and it reflects Jenkins’ journalistic approach to one of the most polarizing and misunderstood issues of our time. McKay Jenkins holds degrees from Amherst, Columbia’s Graduate School of Journalism, and Princeton, where he received a PhD in English. He’s a former staff writer for the Atlanta Constitution, and he has also written for Outside, Orion, The New Republic, and other publications. Today, Jenkins is the Cornelius Tilghman Professor of English, Journalism and Environmental Humanities at the University of Delaware. He lives in Baltimore with his family, and he joins Rob today in Studio A.